Whether it's her United Nations ambassadorship, important clarifications on feminism, Ivy League education, or top-notch acting abilities, Emma Watson isn't just doing something right—she's doing everything right. That includes her untouchable beauty game, which has been on full display lately as the actress makes the press rounds for Beauty and the Beast. But as fun as it is to observe the overt glamor of the red carpet, we tend to be even more interested in the everyday beauty habits of our favorite A-listers—something Watson recently indulged with a Top Shelf feature on Into the Gloss. In addition to revealing gems like the fact that she loves cleaning out her friend's makeup bags, she also revealed that she's been making a concerted effort to choose sustainable, natural products. "Recently I've become super interested in sustainability and transparency and understanding what I'm putting on my face and on my body. It's been a fun little mission to see how far I can go with it," she says. This includes natural deodorant by Agent Nateur ($21), as well as favorites from plant-based beauty brands RMS Beauty and Ilia. But one interesting product recommendation in particular was the lip and cheek stain Watson cops to using "on a daily basis," which happens to be from one of our old favorite mall haunts. It's very wallet-friendly to boot. 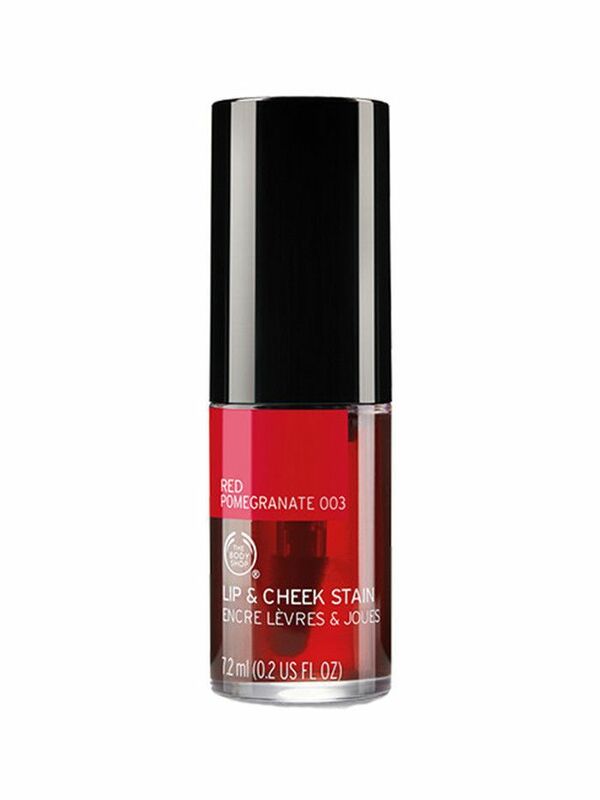 Watson says she uses The Body Shop's Lip & Cheek Stain ($10) in Pomegranate every single day. "It's not certified organic or anything, but they do a ton of awesome work for the environment and fair trade," she says. "It's something I always wear because A) it doesn't really look like makeup, and B) I tend to get very pale. I'm not someone who has a ton of pink in her skin, so I get washed out without a bit of color added to my face. It makes me look healthy and less exhausted." And as for the most important marker of a great lip stain, she can attest: "I like that you can kiss someone while you're wearing it, and it's not going to come off." Adding to the product's versatility is the fact that it's available in nine different shades. It's also fortified with aloe, which means that it's ultra moisturizing and thus seamless—drying formulas tend to make blush and lip colors look cake-y after all. But with a seal of approval from Emma Watson, could we really expect a product to be anything less than stellar? Next, check out the rose-scented hairstyle Watson wore to a recent premiere.